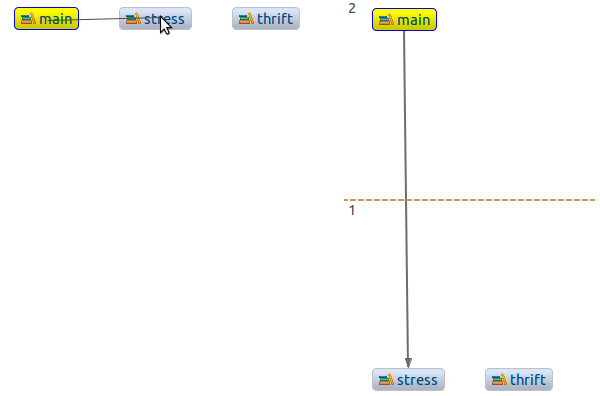 Dependencies between modules that have either been defined manually or that have been generated automatically during the import/synchronization with external project files are visualized in the Workspace Dependencies View. It is important to note that if the Workspace Dependencies were calculated by the software system as a result of the synchronization process, it is not possible to modify them, nor delete or add more dependencies. When Workspace Dependencies can be added manually, a dependency between modules might be created by pressing SHIFT and the primary modifier key of the platform (CTRL on Windows/Linux and CMD on Mac) and dragging a line with pressed left mouse button from source to target module. 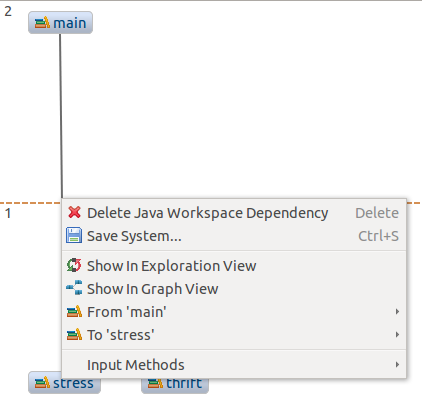 Similarly, if Workspace Dependencies are manually defined, they can also be deleted via context-menu or double-click interactions.